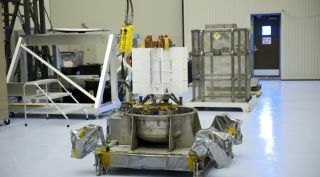 NASA will allow scientists proposing spacecraft for the next Discovery-class planetary science mission to use radioisotope thermoelectric generators for power, citing progress in production of plutonium-238 and projected demands from other missions. In a statement issued March 17, Jim Green, director of NASA's planetary science division, said the agency was reversing an earlier decision prohibiting the use of radioisotope power systems for spacecraft proposed for the next mission in the agency's Discovery program. "We have some liens against the radioisotope power," Green said at a Feb. 21 meeting of NASA's Planetary Science Advisory Group, citing those upcoming missions. The agency, he said, needed to balance mission demands against existing stocks of plutonium and efforts currently ramping up to produce new supplies of the isotope, which should reach a goal of 1.5 kilograms a year by around 2022. "The last thing we want to do is to select a mission and then not be ready to fly it." At the time of the meeting last month, though, Green said the agency was reviewing the prohibition against using nuclear power for the Discovery competition at the request of the scientific community, but didn't offer a schedule for completing that review. "The confluence of when that would happen, and when these two programs would really move out, just seemed to come together a little bit for us and would enable us to move in this direction," he said, referring to demands from Discovery and any future, but undefined, lunar missions. Aiding that decision, he said, was the progress being made by the Department of Energy of restarting plutonium-238 production. "That's gone well," he said, in spite of concerns expressed by the Government Accountability Office in October 2017about scaling up production to meet that goal of 1.5 kilograms a year. The decision to allow the use of radioisotope power systems on Discovery was just one piece of good news at a rather upbeat town hall meeting about NASA's planetary science program. "Overall, planetary science is doing incredibly well," Green said, citing the progress on a number of missions as well as the agency's proposed 2019 budget, which offers $2.2 billion for planetary science. "This is spectacular. Planetary science has never had this high a budget." Green noted that, in past years, planetary science has suffered significant budget cuts at the expense of other parts of NASA. "Many of us lived through some really austere times," he said. "It's now our time in the sun to shine."